We watch a lot of Diners, Drive-Ins and Dives on The Food Network in my home, so when I heard that a restaurant that was featured on the show opened a location in Hendricks County recently, my family and I had to check out Metro Diner in Plainfield. While my daughters and I waited outside for my wife to meet us there from work, we noticed a lot of people leaving Metro Diner with take-home boxes. I always take that as a good sign that 1) the food is great, and 2) the portions are huge. I was correct on both counts. After being seated, we perused the huge menu and the specials written on a huge chalkboard on the back wall. My wife loves chicken and waffles, so she opted for those. I&apos;ve recently been introduced to Pittsburgh-style sandwiches -- and love them -- so when I spotted the Pittsburgh on the menu, my choice was an easy one. My oldest daughter found pigs in a blanket on the kids&apos; menu, while my youngest opted for the kids&apos; waffle. Patrons nearly filled the restaurant while we were there, but they had the wait staff to accommodate the rush, including our very friendly waiter who was attentive without being overbearing or annoying. He made sure our drinks stayed full, and our food arrived promptly. And when our food did arrive, you could hear four jaws drop simultaneously. "Good LORD!" my wife exclaimed when the waiter sat her chicken and waffles down in front of her. "I have half a chicken here!" 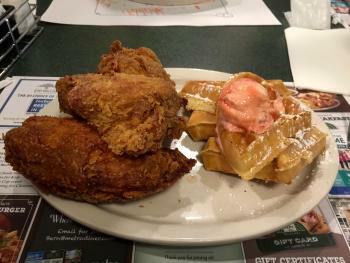 In addition to her half of a chicken, she had a big Belgian waffle topped with strawberry butter. A waitress also came to our table with a bowl and mixed up some sauce for my wife&apos;s chicken right in front of us: just the right combination of maple syrup and Louisiana hot sauce. I would best describe my Pittsburgh sandwich as a work of art, and both of my daughters stared in awe at the huge portions on their plates. My oldest&apos;s pigs in a blanket were actually sausage links wrapped in huge pancakes, both of which are right up her alley. My youngest stared down the barrel of half of a huge Belgian waffle. "Oh my goodness," said my wife as she dipped her chicken in the sauce. "This is soooo good! This sauce really makes for sommmmm mmmmf mmmmm mmmmm......" That&apos;s all that my daughters needed to hear -- they wanted to try some of that chicken, too. My wife said the chicken was juicy and tender while coated with a crunchy skin, and that the dipping sauce was a perfect blend of spicy and sweet. 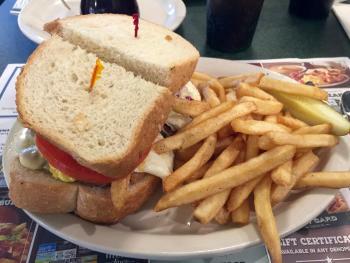 They stuffed my Pittsburgh sandwich with juicy and flavorful roast beef, french fries, cole slaw, a tomato slice and a fried egg in between two slices of fluffy white bread. In case that&apos;s not enough to fill you up, it comes with a huge plate of fries and a pickle slice, too. The sandwich was fantastic. I had never had one with a fried egg in it, but I like fried eggs on my hamburgers, so I was eager to try it. I wasn&apos;t disappointed. They make the food at Metro Diner fresh daily, including their own sauces, compotes and soups. They hand-crack their eggs (no powdered eggs here!) and hand-cut their fries, too. 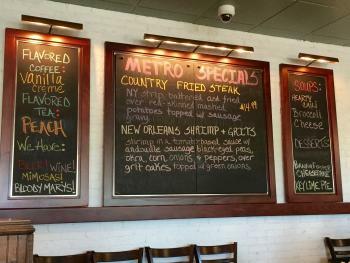 You&apos;re getting fresh, hand-made food at Metro Diner. We had to ask for several take-home boxes because there was no way we could eat all of the food we were served no matter how good it was. Overall, we found the food to be excellent, the portions to be huge, all of the wait staff to be friendly and attentive, the restaurant and restrooms to be clean and well-lit, the prices to be reasonable and the entire experience to be a positive one. I already have my eye on what I&apos;m going to order next time: Yo Halla on the Square. We ate indoors, but Metro Diner also offers outdoor seating when the weather is nice, which will make for a nice dining atmosphere this fall. 302 Dan Jones Road, Plainfield, Ind. Open Sunday through Thursday, 7 a.m. to 8 p.m.; open Friday and Saturday, 7 a.m. to 9 p.m.
Eric Ivie is the Assistant Superintendent for Hendricks County Parks & Recreation, an avid sports fan, and he loves being outdoors and exploring new places and things. He is especially partial to the more rural parts of Hendricks County, where wonderful places and people with impressive skills and talents are hidden away, awaiting discovery. Eric is a married father of two and has lived and worked in Hendricks County since 1999.